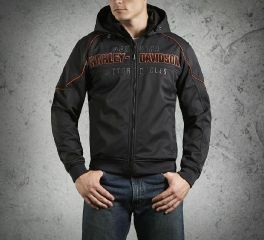 Harley-Davidson® soft shell casual jackets with the H-D® style that you love. 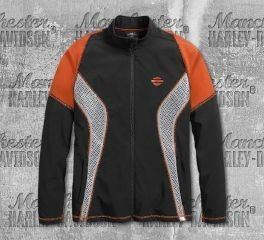 Harley-Davidson® Men's Colorblocked Soft Shell Casual Jacket is made from Four-way stretch 91% polyester, 9% spandex soft shell with brushed polyester backing. It features a full front zipper, zipper chest pockets, zippered hand warmer pockets, reflective piping, and embroidered graphics. 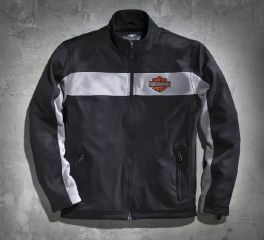 Harley-Davidson® Men's Performance Soft Shell Jacket is made from four-way stretch 91% polyester, 9% spandex soft shell with brushed polyester backing. It features a perforated panels for cooling airflow, full front zipper, snap hand warmer pockets, reflective panels, and high density graphics. The Plaid Fleece Shirt Jacket is a crucial piece for staying warm without bulking up this spring. Cut from soft fleece, this lightweight layer works great over a tee or henley when there's a chill in the air. 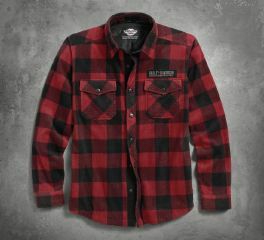 And the bold buffalo plaid is a fresh alternative to dark, solid colors from past seasons. 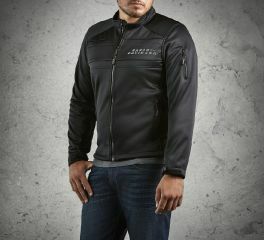 Zip our warm Thunder Hooded Soft Shell Jacket over a tee and under a riding jacket for an excellent mid-layer. You'll no doubt appreciate the longer arms and loops that attach to a jacket. And when you don't need the extra layer, this piece functions as a casual men's fleece jacket. The Idyll Performance Soft Shell Jacket brings wind protection to body and head. 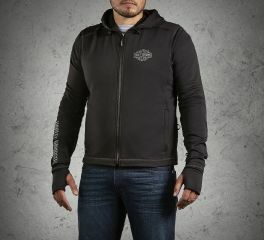 Thanks to the zip-off hood, just convert to "hood-free" style and still enjoy the good looks of this men's casual jacket. For the best attitude, go with distressed jeans or cargoes on bottom. Carefully crafted to best incorporate the warmth and comfort of fleece with the functionality of a soft shell jacket, the Classic II Fleece Jacket is pure perfection.